As the name suggests, ground freezing involves artificially freezing the soil surrounding buried utilities, and in foundation excavations, tunnels or shafts, using freezing probes to form a closed loop system. The technique negates the need for ground water pumping or treatment, and freezing is limited to the project site, reducing risks to adjacent utilities and buildings. PW Trenchless Construction and Canadian Dewatering completed B.C.’s only ground freezing utility project — a $627,000 job that replaced a 100 metre long section of sanitary sewer main extending across the frontage of 9500 Van Horne Way in Richmond. Construction crews used ground freezing for the first time in B.C. on a utility project for the Van Horne Sanitary Sewer project in Richmond, British Columbia. The freezing system, engineered by Weir-Jones Engineering Consultants Ltd., consisted of a refrigeration unit that circulated potassium formate solution, freezing probes, supply and return headers, and an insulated 9,500 litre surge tank. Iain Weir-Jones, founder and chairperson of Weir-Jones Group, said this was Canada’s first use of potassium formate as a refrigerant. Probes in groups from three to six were connected to the supply and return headers in various locations and installed to form a continuous barrier around the freeze pit. They were spaced about 80 cm apart and angled to freeze the base of the pits to stabilize the base of the excavation. It took 29 days to freeze the area—a typical timeframe for most excavations. Site conditions made the project challenging—the existing 350 mm main was five metres below grade in a high water table, with high iron content in the ground water and weak soils. An unstable four-storey block wall ran the length of the excavation site and a CP right of way formed the east boundary. “By freezing, the excavation was completely supported, to the extent that CP could run heavy freight trains within six metres of the excavation,” said Weir-Jones. In utility work, ground freezing forms a barrier around the existing utilities including service connections without interrupting service, said David O’Sullivan, president of PW Trenchless. The cost is mitigated when weighed against ground water treatment for pollutants. Dan Mageau, vice-president and design engineer for Seattle-based ground freezing contracting company Soil Freeze said the company uses the technology in utility projects, pump stations, line relocates, building foundations and tunnelling. The company hasn’t yet worked in Canada, but has bid on a number of projects. 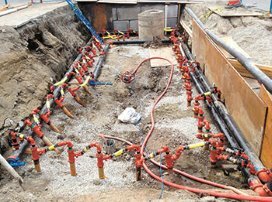 In specialty applications, ground freezing can offer a better option than conventional shoring methods such as soldier piles and lagging, or sheet piles coupled with dewatering, he said. A case in point is when the Port of Los Angeles needed to relocate existing water lines to allow for the deepening of the shipping channel between San Pedro and Terminal Island. The work was completed using microtunnelling with receiving and jacking shafts located on either side of a salt water channel. One shaft was located near the footings of a freeway bridge, another a few feet from a historic maritime museum. Two others were in an active container yard and all four required excavations at least 90 feet below grade. The site’s salty, warm 10-foot deep groundwater was subject to tidal influence. Soil Freeze installed five-foot-thick frozen soil shoring walls with inside diameters ranging from 14 to 22 feet, at 140 to 145 feet below grade. A single row of freeze pipes formed the shoring cell with extra vertical freeze pipes installed through the microtunnel boring machine pathway. After excavation, the general contractor’s jacking and receiving rings were poured directly against the exposed frozen soil of the shoring wall. Freeze pipes were modified and relocated to give the microtunnelling machine clear access to penetrate the shafts. Mageau, who said frozen ground is as strong as lean concrete and essentially impermeable, cites a lack of understanding as a main factor in the rare use of the technology. “People often can’t get their heads around new technology, even though ground freezing has been used in construction since the 1880s,” he said.